I have changed my desktop environment to Linux, and after I tried Ubuntu and Debian, I finally choose the Linux Mint distribution. I think there are some reasons why this distribution take the first place in distrowatch. User-friendly desktop environment and convenient software package manager make me very comfortable. Cause it is based on the Debian and Ubuntu, most of the applications are familiar. The simplest way to install a new Cinnamon theme is with the Themes manager in System settings. The icons extracted in the above directory will be available for the current user only. If you want the icons to be available for all the users, you should extract the icons to /usr/share/icons . Or in Linux mint you can just change icons under setting -> theme -> icons. You didn’t need to edit/etc/apt/sources.list and files under /etc/apt/sources.list.d/ mannually. All customs can be changed through UI. Just click “start menu” and choose the “Software Sources”. And this application can even custom the PPAs. First is web browser, and of course Chrome. I am crazy about Google, and all Google related things. I have used Chrome since year 2011, after I am tried of the Firefox’s slowness. Although Firefox become more and more light, faster this years, I get used to Chrome. And what Chrome done makes me really happy. First thing is the bookmark and extension etc sync. I can reach all of my staff and customizations, after I login into my account. I don’t even need to worry about anything. All my Apps, Extensions, Settings, Autofill informations, History, Themes, Bookmarks, Passwords, and even Open tabs always follow my account. I can reach my opening tab on desktop from my Android phone. I can reopen bookmarks on my home laptop, which I added in my laboratory computer. And I can open chrome://history page to check all current opening tags from signed-in devices, and even check the unread article in the opening tab on my phone and browser all my chrome history. It is necessary to have an input method for typing Chinese which I speak. I choose the sogou input method, because it is easy to use and have a very Good word dictionary. Sogou input method is based on fcitx. In Linux mint setting panel, we have the Language setting, we can choose to install fcitx components. More detail information can be found in this blog article. Following can be done through user interface, no need to run. Pasting here only for reference. After installation, “start”, “Fcitx Configuration” can config the input method, just add “Sogou Pinyin” to the panel. Use to cross China’s great firewall. Don’t need to talk more. If pip is missing, install pip first. PPA is for Ubuntu >= 14.04. To install Qt version of shadowsocks. From:GitHub. 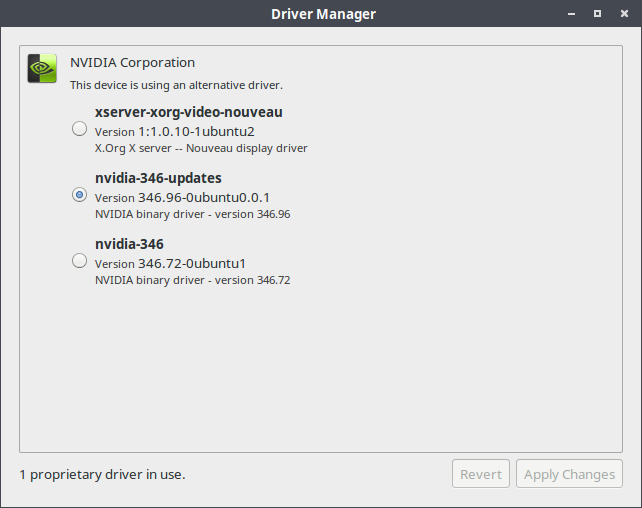 “System settings” , “Driver Manager”, choose the right latest driver and install. After installation, you will find Nvidia icon at the right-bottom corner. Double click the icon to open the setting panel. In order to save the battery , you can use Intel(Power Saving Mode) for most time. And if choose NVIDIA(Performance Mode) for high performance need. If there is no special instruction, all of the following applications can be installed from the Software Manager in Linux Mint. As it official introduction said “Do things as quickly as possible (but no quicker) with your files, bookmarks, applications, music, contacts, and more!”. I set a shortcut Alt+Space to launch Gnome do. And you can just type several keys to start any application quickly. Use F12 to open a terminal. Dropdown terminal, you can right click the terminal after you press F12 to configure your guake. “PlayOnLinux is a front-end for wine. It permits you to easily install Windows Games and software on Linux. It is advised to have a functional internet connection.” I use playonlinux to install Evernote and cloudmusic(网易云音乐). Although I met a lot of problems during installation of Evernote. But finally evernote 5.8.x can be installed on wine 1.7.x. There are several packages you need to install to make PlayOnLinux work. Most of the following can be installed from default Software Manager. Just type name of the application and search then click install. cloud music client and my favourite music client. Here is the link to it’s official site, where you can found clients for all platforms include linux. my favourite cloud notebook with a very clean Android client. 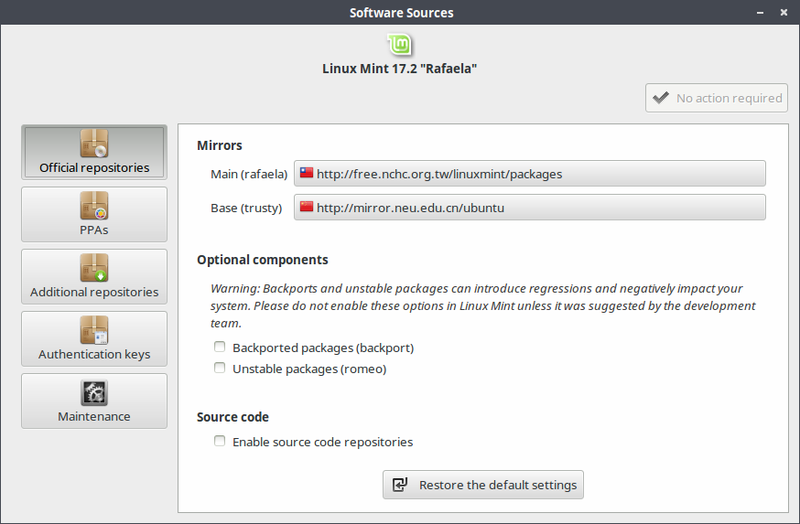 Linux mint 17 has a default screenshot software called Screenshot. It is a very simple screenshot software. Shutter is more powerful. Sync all my files. When I installed Dropbox through it’s offical installer, there was a problem I cannot connect to Dropbox directly from China. Here is a solution to redirect connections to shadowsocks sock5 proxy. You should install proxychains. Then dropbox will start to start and install, then after installation you can set sock5 proxy in dropbox settings. Baidu pan linux port. It is really a great work. Thank the author. Remote desktop connection client able to display and control a remote desktop seesion. It supports multiple network protocols in an integrated and consistant user interface. Currently RDP, VNC, NX, XDMCP and SSH protocols are supported. E-book manager, 电子书管理. It is very efficient when you plug in kindle using USB port Calibre is prepare to serve. one of the screenrecoders I use. Best image and picture manager ever from Google. Office software include writer, spreadsheets and presentation. Password manager. But I prefer LastPass. This client really make me impressed. It is faster and simple than any other platform client. Launch it with Gnome do, and use it to check English word is a very happy work. Someone used to recommand me the StarDict, but I think youdao dict is a better choice for me. Or there is another choice Cairo Dock. and you can find NTFS Configuration Tool in the menu. It is a very efficient tool to auto mount windows NTFS partitions. You can setup to auto-mount when your Linux mint start up. It is really useful if you have a second hard drive installed and you want it to auto-mount each time you restart your system. video player always need one. Personally, I like smplayer more. You can follow the instruction on it’s official site. It was great, espcially when you want to listen to music at Google Play Music, or other cloud stream music. It support a lot of services, like Amazon Cloud Player, Play Music, Plex Music, Spotify, Tuneln, etc. Birdie is beautiful Twitter client for GNU/Linux. PPA (14.04) Birdie can be installed from our PPA, which provides automatic updates whenever we improve the application. all the detail information can be found at it’s official site. Remote control application. I need it to help to connect my mac in lab and other Windows machine. You can download here. And because it is cross-platform. You can install in other OS and connect it easily. Use apt-get search vim to search related vim packages, you will find several packages,like vim-gtk, vim-gnome etc. Install vim and vim-gtk package to install vim and gvim. And config my vim with my dotfile, https://github.com/einverne/dotfiles. best version control system. And I am using SmartGit. Text Editor. Later I found Atom which is also great. sometime need java and c++ IDE for test. Check official site for more information. You can have your local weather forecast in desktop. Screenshot and screencasting tools which saves me a lot of time. I have created a list in Youtube, you can check it for information.